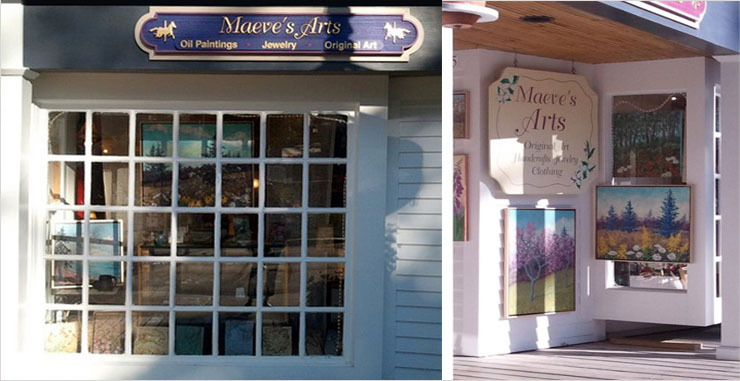 Maeve’s Arts is a Fine Art and Craft gallery located on beautiful Mackinac Island, in Northern Michigan. The Gallery highlights renowned artist Maeve Croghan’s dynamic and stunning oil paintings of Mackinac, the Great Lakes, California, Italy and beyond. Maeve’s vibrant color filled paintings have been shown Nationally and Internationally, and won numerous distinguished awards. Her paintings are in many prestigious collections. The Gallery also features the fine ceramic art of local artisans Porter Heerspink Ceramics, Camp Climax Pottery, art tiles, as well as new and vintage silver and bead jewelry. Maeve’s Arts is located on Market Street where one can meander along ‘Gallery Row’ ~ the less hectic downtown shopping area. The Gallery is open seasonally, mid May through late October and is open daily throughout the summer season. Mackinac Island is an amazingly beautiful Island located in the Straits of Mackinac – the junction Northern Lakes Huron and Michigan. When one takes the ferry to Mackinac, they step back in time. Only bicycles and horse drawn carriages are allowed on the Island. The Island is filled with lovely Victorian homes, Inns and Hotels. Mackinac is known for it’s famous limestone rock formations, high bluffs, and spectacular long water views. Almost 2/3 of Mackinac is State Park, with many walking, bicycle and horse trails for all to enjoy.